Not many cities can claim to have hosted a Ryder Cup and NATO summit within four years. Newport, South Wales is in a very exclusive club. I have affectionate memories of Newport as it’s the place I started work in 1986. I was one of the few who commuted from Cardiff rather than the other way round. Some in South Wales have complained about the disruption – but it’s a small price to pay for the priceless publicity Wales earned this week. We have long been in the shadow of Ireland and Scotland, and we must grab every opportunity to be centre stage. 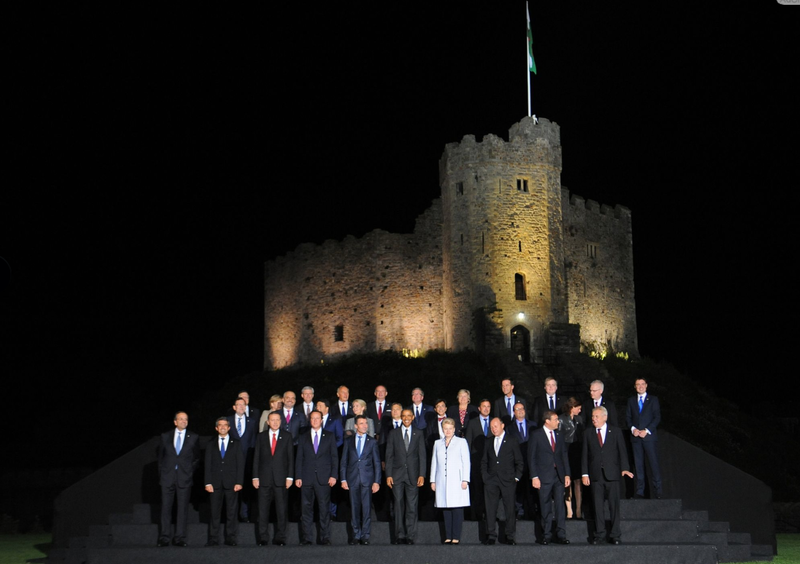 President Obama, David Cameron and other NATO leaders at Cardiff Castle. This entry was posted in Wales and tagged NATO, Newport by Rob Skinner. Bookmark the permalink. “The disruption is a small price to pay for the priceless publicity Wales has earned this week”. Where do we start with all that is wrong with this statement? Hosting the summit has been at the cost of what many might have believed to be traditional Welsh values of peace and internationalism. The ‘Wales’ (of the UK and Welsh governments) has cast away these traditional values to host a conference led by Britain and America and their continued commitment to militarism and conflict, in pursuit of ‘peace’ of course, in a bid to gain international publicity for Wales. The ultimate price will be paid by those on the receiving end of Nato’s next aggressive action. Of course the purpose of a Nato conference isn’t to put Wales on the tourist/international business map, but to sell arms and cement the dominance of America and economic neo-liberalism. Did Welsh people really want to hold a conference at which Obama and Cameron sought to pressure other countries, many facing severe austerity, to ramp up military spending to 2 per cent of GDP? While many won’t be persuaded by the points above, and believe Nato to be a just body, let’s remember it was established, in the aftermath of WW2 to ‘protect democracy’, by America and European countries, including Portugal – then a military dictatorship. However even those who do not object to the principle of Nato must realise the summit hasn’t proved quite the ‘international news mega story’ we, in Wales, have been encouraged to believe it would be. The first day of the summit wasn’t mentioned at all on America’s leading evening news programme, ABC’s World News Tonight – even in a report regarding the ISIS group in Syria and Iraq. While the Welsh media was getting carried away with what Obama’s visit to Wales would mean for tourism, the Prez himself was flying by helicopter to Stonehenge to, in his own words, ‘knock it off my bucket list’. All that publicity for what BBC Wales calls ‘Brand Wales’ literally knocked down by Barack’s bucket list. Even the most ardent Welsh patriot would have to concede Obama strolling among the giant stones has provided the tourist/feel good image of his visit. The disruption wasn’t just traffic delays but giant fences, unaffectionately known as the ‘ring of steel’ being erected on major routes and in Cardiff’s most important public park – a month before the summit. The fence not only caused considerable traffic disruption but gave south Wales an unsettling glimpse of a police state. It also gained significant media coverage – which didn’t make Cardiff look a very welcoming, or even safe, place. Unsurprisingly many people shunned the city centre and other areas secured for apparently essential purposes. A price worth paying? Not for those businesses, especially small independents, that have seen massive falls in takings at a crucial period in the summer.